Every once in a while, a film comes along that puts us critics in our place. 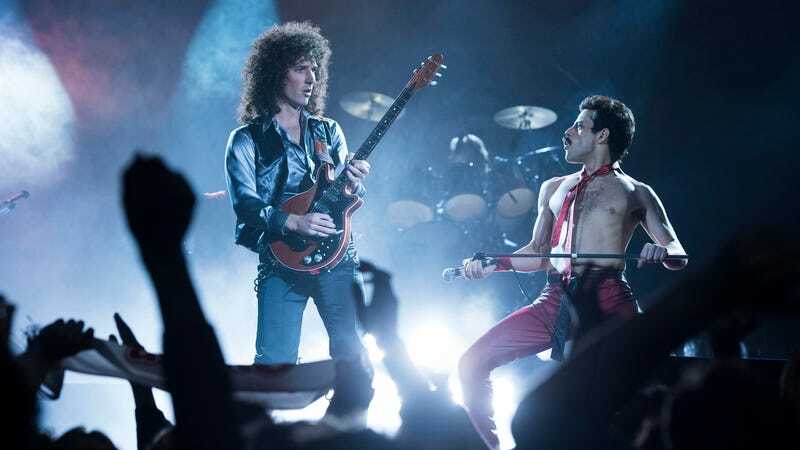 This weekend marked one of those occasions, as Bohemian Rhapsody, the Queen biopic that, just last week, was being dismissed by critics like our own Jesse Hassenger as a paint-by-numbers musical biopic, if not an outright affront to Freddie Mercury and his legacy, became the No. 1 movie in America. By quite a lot, too; the film made $50 million in its opening weekend, more than twice its closest competitor. Apparently, for the average viewer, star Rami Malek’s startling resemblance to Mercury was enough to overcome the troubled production and the scandal surrounding director Bryan Singer—or, as it’s good to remind ourselves every once in a while, the average viewer probably didn’t even know, or care, about that particular bit of film-world controversy. We still think it’s shameful that Singer continues to get work despite the multiple sexual-assault lawsuits that have been filed against him; perhaps if the Esquire story allegedly detailing Singer’s history of sexual misconduct had actually been published before Bohemian Rhapsody’s debut, that could have made a difference? It’s difficult to say, but the silence around Singer continues to be frustrating. Meanwhile, the No. 2 film this weekend, The Nutcracker And The Four Realms, offers a lesson in what will keep audiences away from a movie: Ennui. The latest in a line of hollow live-action films based on Disney animated classics (or, in this particular case, a particularly juicy public-domain property), The Nutcracker And The Four Realms came in on the lower end of industry estimates, making $20 million in its first weekend. Audience response was similarly tepid, logging a B+ CinemaScore—on the low end for a family film/visual spectacle like this one, according to Box Office Mojo—and a 42 percent audience score on Rotten Tomatoes, just a few points higher than the 34 percent of critics who gave it positive reviews. Rounding out this weekend’s top three is another seemingly critic-proof director, buoyed by a popular star: Nobody’s Fool, the latest from one-man movie studio Tyler Perry starring Tiffany Haddish and Tika Sumpter. That one opened with a $13 million, No. 3 debut; that’s pretty solid, if $4 million down from Tyler Perry’s Acrimony’s $17 million debut (on 400 fewer screens, no less) back in March. In fact, Perry’s box-office prospects have been steadily declining over the past couple of years: Boo! A Madea Halloween debuted with an impressive $28 million back in 2016, followed by a $21 million debut for Tyler Perry’s Boo 2! A Madea Halloween in 2017 and Acrimony’s $17 million debut. This weekend’s specialty box office was pretty sleepy, with Boy Erased, another film that was met with a resounding “meh” by critics, pulling in the week’s best per-screen average of $41,411. Luca Guadagnino’s Suspiria remake finally went wide-ish on 311 screens after what feels like months (it was actually about a month, following our review from Fantastic Fest) of buildup; it did okay, adding $979,882 to last weekend’s debut for a $1.2 million domestic haul so far. And although the film has undoubtedly been divisive, the “rare, semi-coveted F CinemaScore” (as we dubbed it in our coverage of Mother!) we anticipated for the film will not come to pass, as it’s not opening wide enough for that particular metric. Ah, well. There’s always the next art-horror remake.